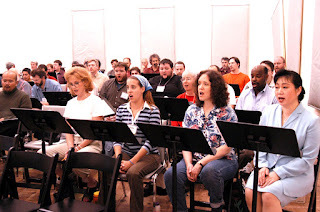 Seattle Opera Blog: Sing along with the Seattle Opera Chorus at Fidelio rehearsal! Sing along with the Seattle Opera Chorus at Fidelio rehearsal! UPDATE: The Fidelio sing-along is now completely full. Thank you to everyone for the great response! Seattle Opera wants to hear your voice! Channel your inner opera singer and join us for the company’s first-ever community sing-along on the evening of Wednesday, September 12. Up to 50 people will have the opportunity to add their voices to the Seattle Opera Chorus at a rehearsal of Beethoven’s magnificent Fidelio. Guest Chorus Master John Keene and members of the Seattle Opera Chorus will spend an hour teaching participants to sing the opera’s lively finale, in which prison walls are broken down and citizens rejoice in a tyrant’s downfall and celebrate freedom, courage, and love. Then the group will join the full 58-person chorus for a sing-along of this tuneful burst of joyous sound. Participating singers will also hear from General Director Speight Jenkins, who will introduce Fidelio and discuss the significance of its powerful conclusion. Following the sing-along, participants are invited to stay and observe an hour of chorus rehearsal. Only 50 spots are available for this special event, one of Seattle Opera’s new community engagement initiatives. To reserve a spot, send an email with your name and contact information to education@seattleopera.org immediately. The first 50 participants will receive a confirmation, with digital copies of study materials including music and a pronunciation guide (the opera is sung in German). Who: You! No prior experience necessary. What: Join the Seattle Opera Chorus in rehearsal for Fidelio, and learn to sing music from Beethoven’s only opera. When: Wednesday, September 12, 2012, from 5:30 p.m. to approximately 8:30 p.m.
Where: Seattle Opera Rehearsal Studio, 200 Terry Ave. N in South Lake Union. Limited street parking is available; location is near the Terry & Thomas stop on the South Lake Union Streetcar. How to Prepare: Participants will receive digital copies of study materials in advance, including music and a pronunciation guide. How to Sign Up: Please email education@seattleopera.org with your name and contact information. Sign-ups are on a first-come, first-serve basis. Maximum 50 participants.